Foreword by Paul W. Bryant Jr. If this were just another Alabama football book I would neither read it nor review it. The world does not need another game-by-game, play-by-play recapping of another however-glorious season. Even the title I take to be a subtle variation on the dubious pronouncement “winning isn’t everything; it’s the only thing.” Football is a serious game, true enough, but war is not a game at all. 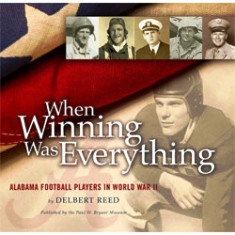 This highly readable, informative book is in part about football, but it is more about the roles that Alabama football players and coaches took in the fight against the Axis Powers in WWII. It should come as no surprise that young, patriotic, disciplined, physically fit men signed up for the service and that they were highly desired. Each of these chapters contains a brief biographical summary of the man, (a surprising number were from Arkansas), a summary of their football careers, and then a look at their service careers, and, in some cases, like that of Lt. Paul Bryant, a longer look at their post-war careers. Charley Boswell lost his sight in combat in Germany and later became the best blind golfer in the world. Ed Clark helped liberate Dachau, and the photos that accompany his section are as disturbing as ever. Holt Rast saw 304 days of combat over a period of three years in several theatres of war and may be the most decorated of all the servicemen discussed. William T. Van de Graff, UA’s first All-American in 1915, may have been the oldest player to serve. Tom Borders, who was himself killed on December 26, 1942, over Tunisia, was the first American to shoot down a German plane in World War II on August 17, 1942. Roy Johnson, who logged 35 missions as a bombardier, may have been at 5’2” the smallest man ever to play football at UA. The most dramatic story in theatrical terms may be that of Hugh Barr Miller Jr. After his torpedoed ship sank, he ended up alone on Arundel Island in the Pacific. During the thirty-nine days the Japanese searched for him, Miller, wounded and starving, killed fifteen of the enemy. These entries vary widely of course, but many of the vets, or their families, said some of the same things. A number felt their lives were saved by the bombing at Hiroshima and Nagasaki, and almost none of them talked much at all about their wartime experiences.